For your completed Mini-tourneys & Tournaments, you can now review your own dominoes games visually game-by-game, move-by-move. You can only review your daily list of dominoes games if you are logged in. To review your Dominoes Ticket games in 'Manage Account', you can select 'mini/multi-player tournaments' or 'account statement', and then select 'view' for a specific game. 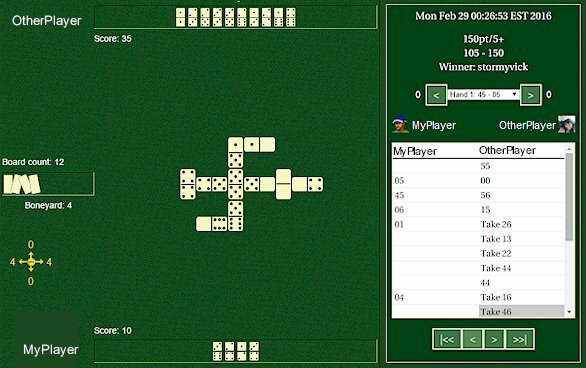 Below is a sample dominoes game as seen using a dominoes game viewer. On the right-hand side of the dominoes board there's a game navigation panel. You can navigate within each game of the match and move through each move within a game. If the VCR-like 'Play' button is pressed once in the real Backgammon Viewer (as opposed to the picture below), this move would visually play out on the board and the turn would switch.